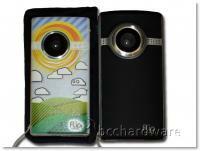 We are following up our review of the Flip Ultra camera from a little over a year ago with the latest and greatest from Flip - the MinoHD. The MinoHD has gone through several revisions, and this latest 8GB model has a larger screen and some extra features that make it a worthy consideration if you're considering a compact flash-based video camera. Its small size doesn't allow for "AA" batteries to be used and it incorporates an internal lithium-ion battery that can be a blessing and a curse. The beauty of "AA" batteries is that you can have an extra set handy - with the MinoHD, if you're battery dies on a camping trip, you'll have to wait until you can get power before you're up and recording again. With that in mind, let's see what this 720p mini camera looks like and how it performs. 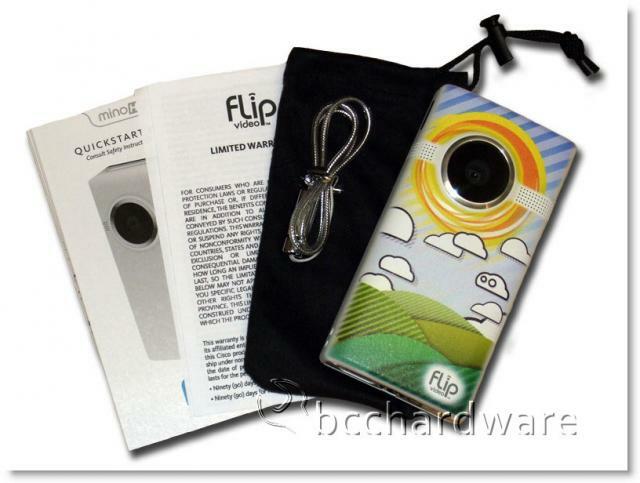 The Flip MinoHD comes is a small box that holds the camera, wrist strap, soft pouch and some documentation for the little unit. There is no software CD as it comes pre-loaded on the MinoHD camera itself. 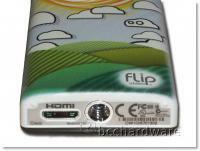 As I mentioned last year regarding the Flip Ultra; this is a great idea and one that every company should follow. Other than that, there is nothing all that impressive in the box - it would be awesome if they included a mini-HDMI cable to go with the camera but alas, it is not included. 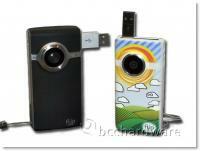 The Flip MinoHD is wonderfully small and compact. 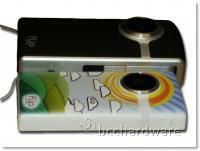 It is about the size of a smaller smartphone and is very thin for a camcorder. It has a beautiful (albeit small) screen with a capacitive touch interface on the back. The screen itself is not driven by touch, but the buttons on the back are and they work very well. The MinoHD comes in several "Designable" models as well as some that you can pretty much design yourself. PureDigital sent us this fancy design and while it looks a little childish, it still has a fun feeling to it. I wouldn't necessarily bring it out at a board meeting, but everywhere else, it's a good time. The left side has the USB eject button while the right side hold the power button. As previously mentioned the back contains the controls for zoom, volume, playback, recording, navigation and deleting videos. Other than the red physical "record" button, all buttons are capacitive touch. You get an idea of how small the Flip MinoHD is when you see the mini-HDMI port on the bottom next to the 1/4" tripod screw-hole and the USB ejected. It's not a large unit at all. Before we head on over and take a look at some features and specifications, I thought I'd show a few comparison images between the Flip Ultra and the Flip MinoHD.